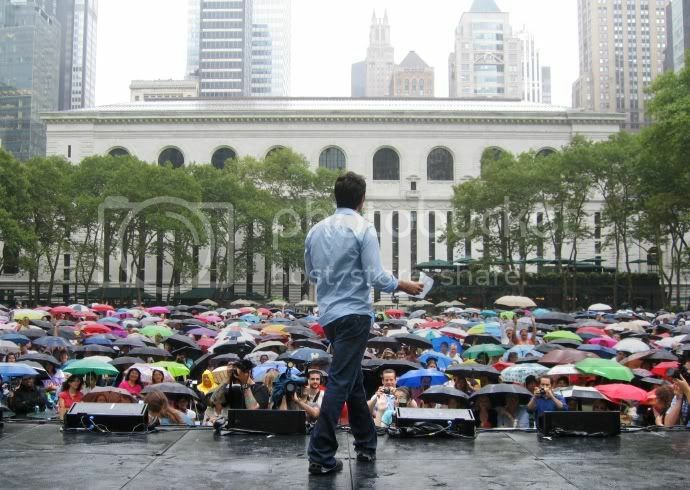 The 2009 season of Broadway in Bryant Park ended today with a memorable appearance by John Stamos, the soon to be star of Bye Bye Birdie at Henry Miller’s Theatre, located just around the corner from the park. The casts of Mamma Mia! and Altar Boyz performed under a cloudy sky, but a light rain began to fall as stars of South Pacific took the stage, followed by Matthew Morrison of Fox TV’s new musical comedy, Glee, who sang the John Denver’s classic, “Leaving on a Jet Plane”. Hardly fazed by the rain, the audience popped up their umbrellas and sat tight, their applause as loud and enthusiastic as ever. John Stamos arrived on the scene around 1pm. He graciously posed for pictures and gave autographs to many of his fans, and even signed a photograph sent to us from an admirer in Germany who read of his Bryant Park appearance online. She sent us a picture along with a note describing how much it would mean to her to have an autographed photo of John. Included in the envelope was enough postage to mail it back overseas - how could we refuse such a request? Stamos watched the performances from backstage, then spoke about his upcoming role on Broadway before introducing the cast of Billy Elliot. 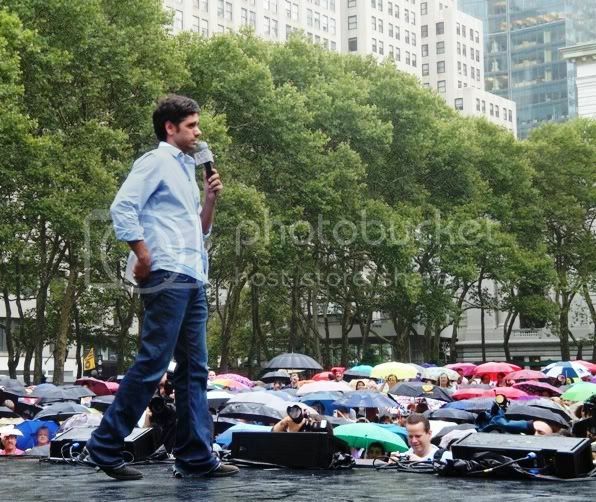 We were so impressed by the number of people who remained in the park despite the unfortunate weather. 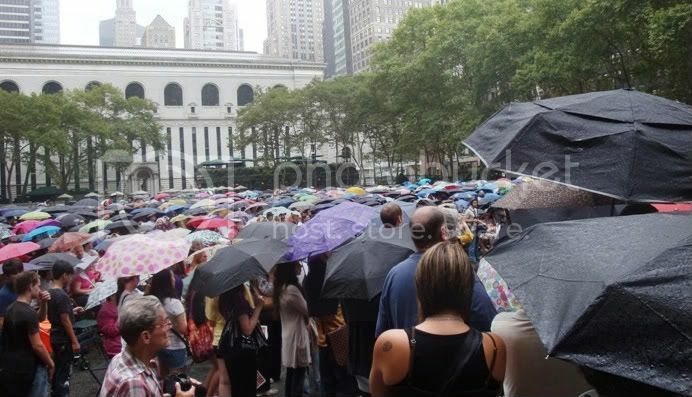 If you ran for cover or just couldn’t make it to the show, be sure to check out Lite fm’s website for a recap video of today’s conclusion to another fabulous season of Broadway in Bryant Park.